My plants seem to dry out quickly. Hello, I have been growing some heirloom strawberry's and some random bell pepper plants in my home under a large grow light built around a covered box. It doesn't get too hot in there, in fact it stays around room/floor temperature(45-75 F). There is plenty of air running through it too. My problem is that some times my plants will begin wilting if I expose them to the air and light directly. Not all of my plants do it, but my bell pepper plants specifically love wilting over when exposed to the light and air. I have to keep them covered by a clear plastic bucket to prevent them from wilting or drying up. I keep them well watered, the soil doesn't dry out so I don't know why this happens. Can anyone with similar experiences offer some insight? These plants are several months old now. Re: My plants seem to dry out quickly. Somehow, I'm not quite getting the picture. You said the plants wilt and dry out if "exposed to the air and light directly," but you also said "There is plenty of air running through it too. " but then you said they are covered with a [clear?] plastic bucket and I don't see how there could be plenty of air running through a plastic bucket. How is the light set up so that the plants are not exposed to it directly? "I keep them well watered, the soil doesn't dry out so I don't know why this happens"
What kind of soil mix are they in? So, you really have checked and know that the soil is still moist when the plant is wilted? That would make it seem that it is not a water issue (unless of course you are really over-watering to the point that they are getting waterlogged). They need warmth, light, moisture, and humidity. If they are getting all that, then it is an issue with the plant. I would (gently) pull one of the wilting plants out of the pot to see what the roots are doing. It seems like it has some kind of root problem that is not allowing it to take up water that is there. Sorry about the contradictions! I didn't convey everything the way I meant. All of my plants are about 4 months old. I keep some of them covered with saran wrap if they don't take too well to the open air. By this I mean the leaves start falling over after a few hours of exposure. When they are covered they do great and perk right up. I began keeping them under saran wrap in order for them to retain water and grow a bit stronger because they would not survive otherwise, for some reason. I keep the plants misted(usually once at the end of the day and again in the morning as a terrible attempt to mimic condensation). Once every week or two I give them a good watering and at least once every 3 weeks I loosen the soil up slightly with a thin metal rod. The plants that have not been covered in saran wrap for weeks don't slump over look as if they're dying, even if they go without watering for a day. But the plants that are newly uncovered will do so within a matter of hours, even if they have been watered/misted. One of the bell pepper plants has been uncovered the whole day, the other began slumping over within an hour of exposure, but I think it's starting to pick itself back up. However two of my strawberry plants are doing it. Here are two pictures of my small box, with both bell pepper plants covered(with a bucket as mentioned in the previous post) and some strawberry plants covered / uncovered. This picture is a few weeks old now, but this has been an on-going issue since I began my adventure. Also, when should I begin moving my plants into larger containers? I have been doing all of this on my own with no experience or much information before hand so I really don't know what I am doing. Last edited by oggy on Wed Jan 29, 2014 12:10 am, edited 1 time in total. How does the air get in? Are you using a fan, an open window or is the room open to air. If your mix is moist the only other way I know a plant can wilt will be from a lot of wind hitting it. If the plants are 4 months old, how big are the pots. 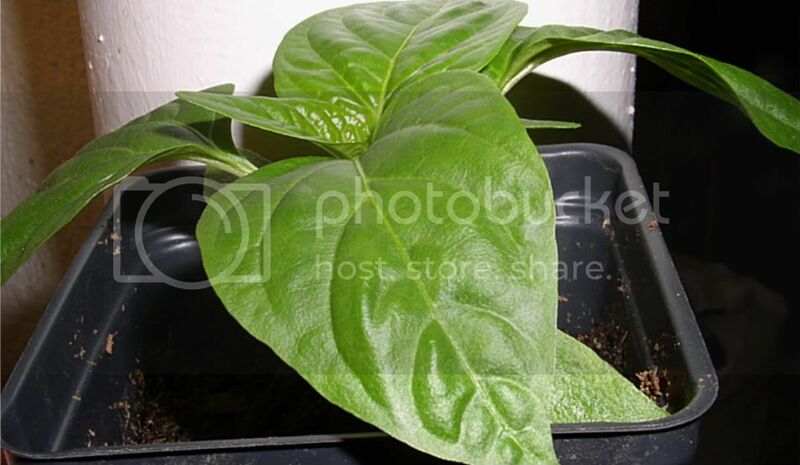 Peppers need to be potted up as they grow otherwise the roots fill the pots and they will wilt without daily watering. My 4 month old peppers in one gallon pots would be producing peppers and would dry out daily in a peatlite mix. I would have to either water daily or pot them up to 5 gallon pots to keep them productive and give the roots room to grow. They still sit in paper coffee cups right now. I have updated my post with new pictures that I just took. My box is open in the side and also has a small fan that is run for an hour each day (controlled and monitored by an Arduino). And the soil is an Espoma Organic seed starter soil that I picked up back in September. Also, one of the bell pepper plants looks like it's starting to produce bulbs for flowers. I don't want the pepper plants to grow in doors but rather I started them early so I can plant them outside this spring. I'm still not sure about the wilting and none of the plants in the pics look particularly wilted. They look pretty healthy, in fact. The peppers in the new photos do look like they are outgrowing the cups and should be up-potted. And seed starter mix usually is sterile with no nutrients in it. Plants as big as these should definitely be getting fertilized or moved in to regular potting soil with nutrients. I don't think you have told us where you are? So basically you are saying they (tend to) wilt when exposed to the air/fan and perk up when covered. Sounds like a humidity issue. Indoor humidity can be very low, especially if you are in one of the parts of the country (like me) where it has been very cold, so your furnace runs all the time to keep up. Having the fan on it would exacerbate that. I'd turn the fan off for awhile and see if that helps. And keep misting the plants. Figures! The day I finally ask questions with up to date pictures the blasted things decide to look their best! I live in Vermont. It's extremely cold here currently, and I have a wood burning stove in the same room as the plants are located. The soil that I used was very lightly mixed with some Azomite that I received from my local shop. The plants have been up potted once before when they began germinating from a container with no Azomite. I'm going to try and pick up some more bags of potting soil and move them into larger pots, today. Hopefully they take well to a more permanent container. I'm thinking maybe you just need to remove the covers gradually? Extra holes in the plastic wrap, leaves a little bit uncovered, uncover for incremental 30 min-1 hr .... Until the plants toughen up a bit. Get them used to obtaining moisture from the roots and "hold their breath" as it were / close their pores to conserve moisture. If you are in a room with low humidity heated by a furnace, a humidity tray might help. Yeah, so. None of my plants are doing this drying out business anymore. Next time I'm going to preemptively complain about it so they never start doing it. I moved my Bell Peppers into a larger container. Hopefully the clear plastic will shed some light on root growth for me. You don't have problems planting in clear plastic? I ask because I only plant orchids in opaque or clear pots because they photosynthesize with roots. I haven't had much luck planting anything else in clear plastic, most roots do not like being exposed to the light? imafan26 wrote: You don't have problems planting in clear plastic? I ask because I only plant orchids in opaque or clear pots because they photosynthesize with roots. I haven't had much luck planting anything else in clear plastic, most roots do not like being exposed to the light? The pepper plants were from seeds I saved from a store bought pepper. I don't expect much from them but want to see how the roots grow in such a container. Also it seems that I spoke to soon. One of the pepper plants leaves have began sinking down like usual. Ugh! I will be using the same plastic containers for my strawberries but I was planning on spray painting the outside with a black or green latex paint. There is something they aren't getting. Even in the "good" picture where they were up-potted, they look mildly wilty. Peppers usually have substantial leaves that are held horizontally. So I don't know if they need more water, more nutrients or what, but they are struggling a bit. I'm starting to think it's all a water issue. Even for my strawberries. I have only been misting them in the mornings and afternoons and then giving them a good doze of water every week or so. I gave the peppers a good watering last night, way more than I've ever given them before and the leaves completely changed. They are as you described them on one of the plants, perked up and horizontal. The other looks like it wants to do the same, but it had began letting it's leaves droop down the night before. Also I woke up this morning and two of my oldest strawberry plants had fallen over. Back under the saran wrap they go. One thing I haven't mentioned before. Before I put them under the saran wrap I always given them a very heavy misting so that the water can be retained in the cup and not evaporate out. They usually perk right up within a day after that. Now speaking of nutrients, can any one recommend a nice general purpose plant nutrient that I can try? I don't know much about gardening and I would hate to accidentally feed them the wrong stuff. Does Azomite count as a nutrient? I mixed about 2 tablespoons of it in layers of soil that you see the pepper plants sitting in. The soil that the strawberry plants sit in also has very little of the stuff. It's a very fine powder. Oh yeah. I missed where you told us you were misting the plants. Misting is NOT a good way to water. What you are trying to water is the roots in the soil. It is very hard to mist enough to really moisten all the soil around the roots. If you don't the peat can dry out, when it becomes water repellant and then it is impossible to mist enough. What you need to do is pour water on them until it runs out the bottom. Need to quickly diagnose these cayenne plants. Question about peppers rooting quickly!